Until forty years ago, there were hardly any buildings of any kind within half a mile of here. This area was the southern part of the Heathlands, which surround the town centre of Ipswich. In medieval times, this was part of the parish of Sproughton. By the early 20th century, there was a large house at Stone Lodge, Belstead House to the south, and the large Sproughton Chantry House in what is now Chantry Park. If any Catholics lived up here before the massive postwar expansion of Ipswich, they must have been few and far between, and they would need to trek into town to St Pancras for Mass. Some eight miles to the south-west, however, is the large village of Brantham. A Catholic church was established here in 1919. Brantham is on the Essex border, and the neighbouring village of East Bergholt housed a community of Benedictine nuns. These nuns worked within the Brantham parish, and helped establish a mass centre at Capel St Mary, between Brantham and Ipswich. In 1946, the nuns left East Bergholt, and their building was taken over by a community of Franciscans. The Franciscans administrated the Brantham parish, providing priests, and then in the late 1950s the Borough of Ipswich expanded rapidly southwards, creating the Chantry and Stoke Park estates. This new housing was technically within the Catholic Parish of St Pancras. 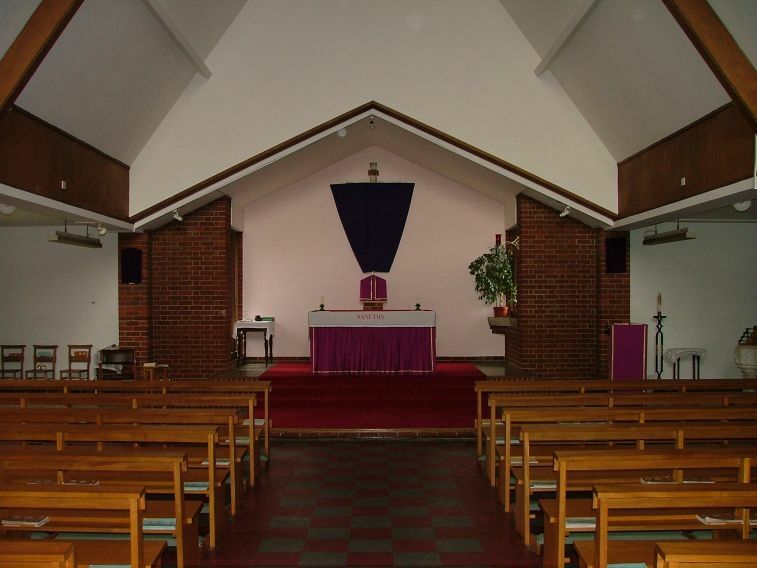 The diocese decided to build a new church on the Chantry estate, and at the same time to integrate the parish of Brantham into the new parish of St Mark. This would make St Mark similar to most of the other Ipswich churches, which, with the exception of St Pancras, serve large rural wedges beyond the Borough boundary. But more change was to come. In 1973, the Franciscan community, in the spirit of the second Vatican Council, left their rural idyll at East Bergholt. The building, Old Hall, was sold to a group who established a commune, which is still there to this day. Most of the Franciscan community moved to Canterbury, but some of them established a smaller community beside St Mark's church on Chantry. 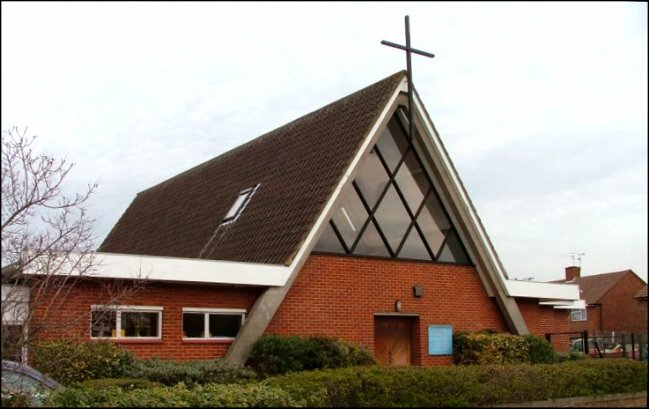 They continued serving the mass centre at Brantham, and the community at Capel St Mary now shares the Anglican parish church there, celebrating their mass on a Saturday evening. 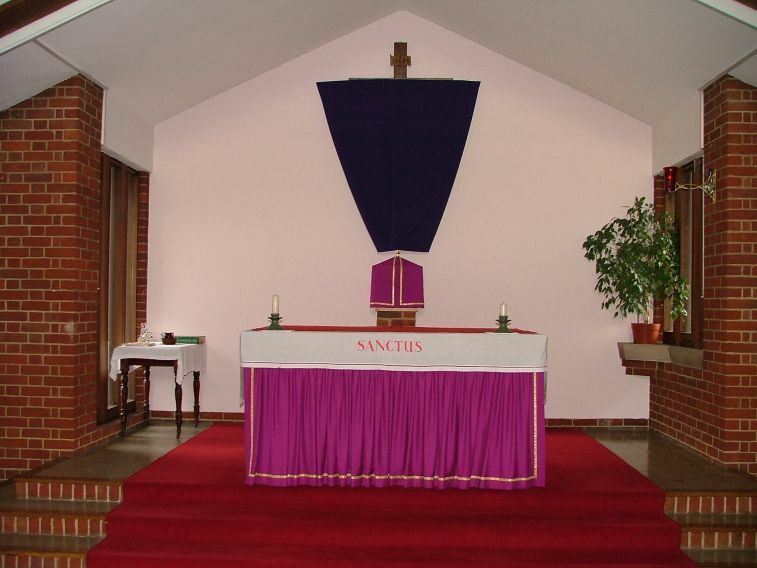 So the parish has three centres, each 4 miles apart, with little connection between them. In 1993, the Franciscans finally left the parish. There are, of course, many church buildings which are not geographically in the centre of their parish. But St Mark illustrates this situation in extremis; it serves a large parish, more than 8 miles from top to bottom, but is located right in the extreme north-east corner of the parish. Another few hundred yards, and you find yourself in the parish of St Pancras. St Mark is most well known for its unusual prism shape, like a large Toblerone, although in fact there is rather more to this 1960s building than that. The triangular motif is accentuated by the frontage. The church deserves a more prominent site, hiding in the shadows of the Anglican St Francis as it does. They are both excellent buildings, of a period when excellent churches are rare in Suffolk. Pevsner liked them both. Of the two, this one I find the more wholly pleasing, since there is no tension with adjacent spaces as at St Francis. The presbytery links on successfully, and the corner site allows a side view, which gives it scale. Otherwise, it might disappear behind its hedge completely. In 1999, this church is being greatly extended to the (liturgical) south, without threatening the integrity of the frontage. Internally, the massive frontage glass is necessary, otherwise this would seem a dark, even claustrophobic space. 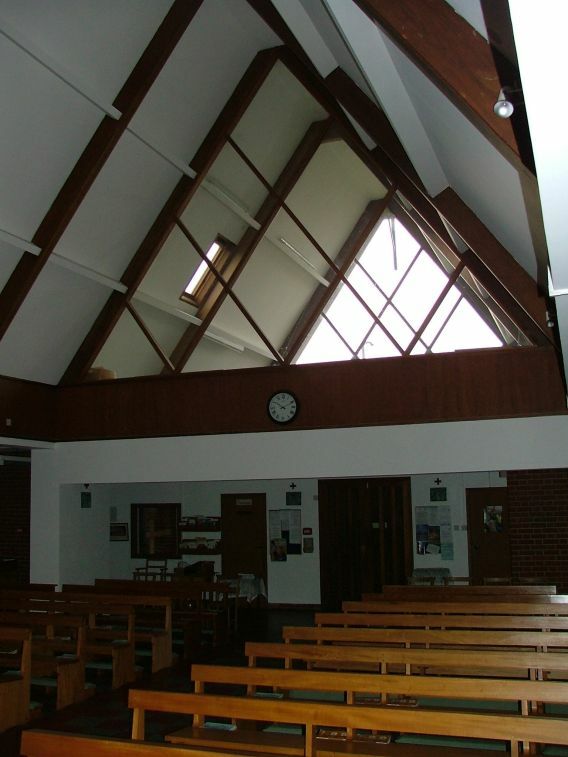 It is instructive to compare the wooden roof here with Birkin Haward's fine concrete roof at Castle Hill URC across town. As I said, this is a huge parish, covering the relatively poor and needy Chantry and Stoke Park areas, but also stretching out into the wealthy villages of south Suffolk. 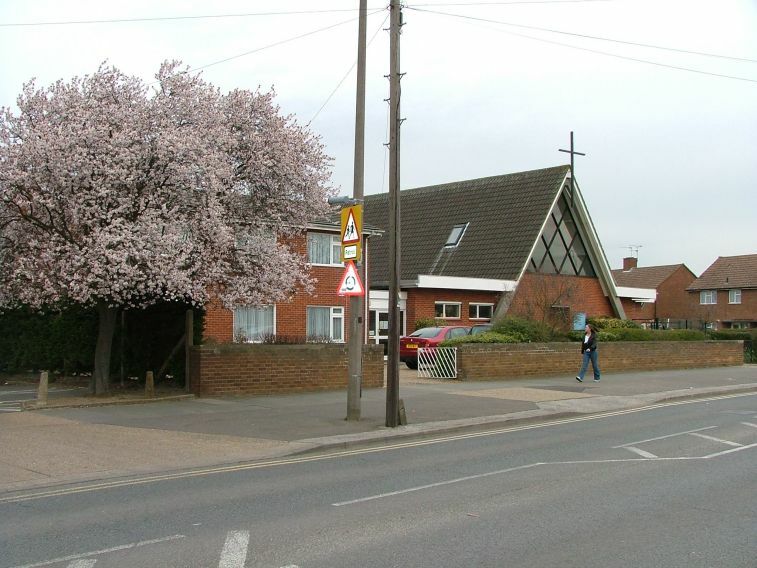 The current upsurge in Catholic numbers in East Anglia has not touched this place as much as some of the other Ipswich parishes, but even so the building is no longer really big enough.